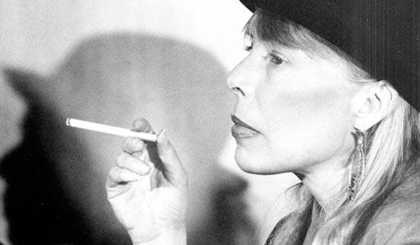 JoniMitchell.com is the official website of Joni Mitchell and is privately maintained, managed, funded, and hosted by Les Irvin. Neither Joni Mitchell, her management, her record company, nor any other affiliated organizations have any involvement in the day-to-day content and financial decision-making and may in no way be held liable for any infringements of copyright. Copyrighted material on this website is used in accordance with 'Fair Use', for the purpose of study, review or critical analysis, and will be removed at the request of the copyright owner(s). As a non-profit, non-revenue producing site, JoniMitchell.com provides its content as a free, educational, and informative service for its readers. Copyrighted content on this site may not be further used for profitable purposes without the expressed written permission and consent of the copyright owner. (ii) Identification of the copyrighted work claimed to have been infringed, or, if multiple copyrighted works on JoniMitchell.com are covered by a single notification, a representative list of such works at JoniMitchell.com. (iii) Identification of the material that is claimed to be infringing or to be the subject of infringing activity and that is to be removed or access to which is to be disabled, and information reasonably sufficient to permit JoniMitchell.com to locate the material. (iv) Information reasonably sufficient to permit JoniMitchell.com to contact the complaining party, such as an address, telephone number, and, if available, an email address at which the complaining party may be contacted. For more information, see Section 512: "Limitations on liability relating to material online" of the Digital Millennium Copyright Act of 1998.